Somewhere in your neighborhood resides a lady with multiple cats. She might love those felines, but many would identify her as a crazy cat lady. Rumor has it that she can’t hold a romantic relationship down to save her life. Whether that’s true or not is not up to you or anybody else to confirm. Just know that she has a thing for cats and that keeping pounds of cat food in her home is her prerogative. We’re only here to share with you the crazy cat lady memes that’ll tickle your funny bone and leave you scratching your head at the same time. On a scale of one to ten, how fun do you think this game would be? If you didn’t say ten you aren’t using your imagination hard enough. As you pull away one box you have to also avoid getting clawed at. Then if you successfully pull the box out, you have to hope the cat in the box underneath doesn’t get hit in the head as well. 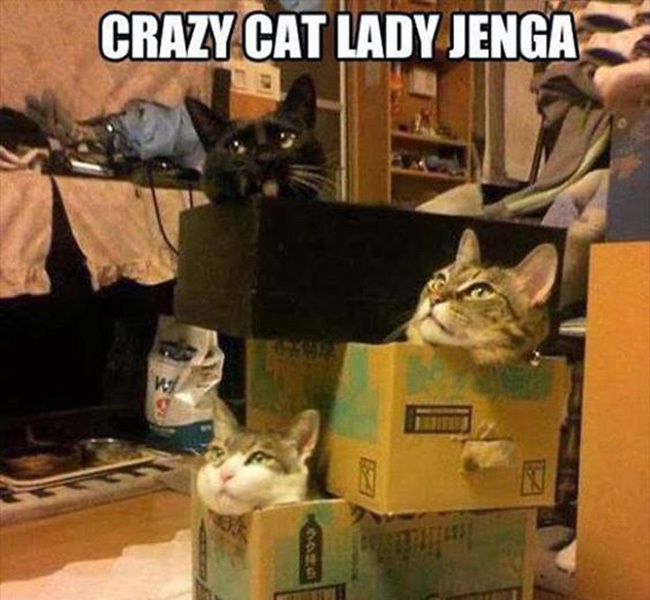 There’s a lot that goes into playing Crazy Cat Lady Jenga.